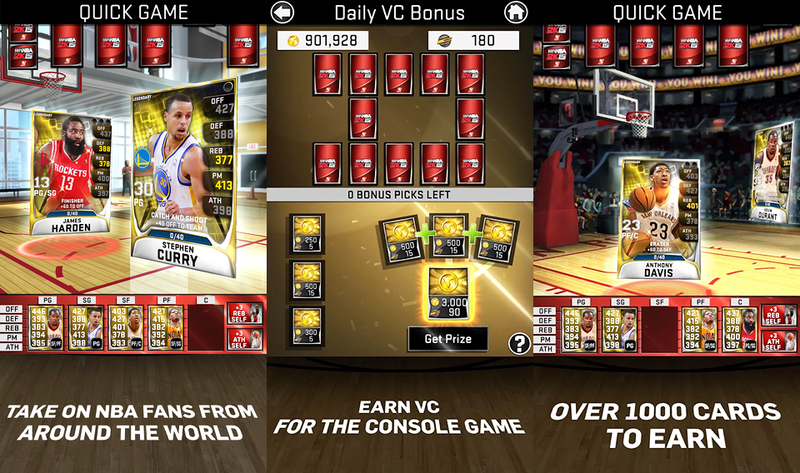 2K Sports have launched the free NBA 2K15 companion app for Android and iOS devices. MyNBA2K15 allows gamers to redeem Locker Codes, purchase items in the MyPLAYER Store, earn VC (virtual currency) daily, and utilize a chat function from your device when you’re playing in MyPARK. MyTEAM Mobile is a NBA themed card battle game independent of the one on your console/PC. It has over 1000 player cards with new backgrounds and photos. The My Team Mobile game offers improved season matchmaking that lets you be paired with opponents of equal skill for a competitive season. MyPark Chat! - With this mobile exclusive, use your mobile device to text other players hanging out in the Park! MyPLAYER Store - Browse through the console store to check out and purchase items that will transfer over to the console from your mobile device. Redeem Locker Codes – Enter Locker Codes into MyNBA2K15 wherever you go. Daily VC Bonus - Grab quick VC or save up to be able to earn even more! Improved Season Matchmaking – Get paired up with opponents of equal skill for an ultra-competitive season! New Quick Game Reward Tiers – Quick Game rewards scale up with your team. The better your team, the better rewards you will receive. Card Enhancements - Each card will now have 1 to 3 slots that you can customize to boost that card’s strength. Additionally, cards now feature 5 attributes to provide even more specialization. Season Coach Cards – Use these cards to give your team a boost during important stretches of the season. Positional Importance - You will now receive bonuses for playing players in their proper positions.